With sales rev enue of 821 million Swiss francs, performance in financial 2016 was better than expected. Operating earnings totalled 89 million Swiss francs after deduction of Research and Development investment of 101 million Swiss francs. 56 additional jobs were created across the Group as a whole. 117 aircraft were delivered to customers. The PC-24 development programme is proceeding according to plan. Notwithstanding a drop in sales revenue compared to the record years of 2014 and 2015, financial 2016 was a successful year for Pilatus, and exceeded expectations. Total sales amount to 821 million Swiss francs, with operating earnings at 89 million Swiss francs. Orders in hand as of the end of the year under report are at a comfortable 1.7 billion Swiss francs – not including sales revenue from the PC-24! Both pillars of performance report a successful year In 2016, our General Aviation operations contributed 56 percent of total sales; this is the first time this business unit has accounted for the largest share since 2012. 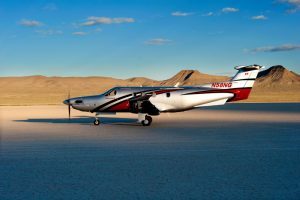 Sales of the PC-12 NG were up 30 percent on the previous year, with 91 aircraft compared to 70 in 2015 – this in an environment in which all the major business aircraft manufacturers have had to contend with stagnating or declining sales figures. Categories: Blog and News & Events | Tags: Aircraft, aviation, official media release, pc-12, pc12, Pilatus, pilatus business, PRESS RELEASE, Skytech, and Skytech inc. This entry was posted on Friday, April 28th, 2017 at 9:52 am. Both comments and pings are currently closed.